A rare “Ring of Fire” total eclipse of the Sun will occur April 29, 2014. Unfortunately, it will most likely be seen only by folks in southeastern Australia, some penguins and a Tasmanian Devil or two. Please note that April 29 is “local time”. But, for example, in the western United States – where the eclipse won’t be seen at all – it occurs late on what is the evening of April 28. 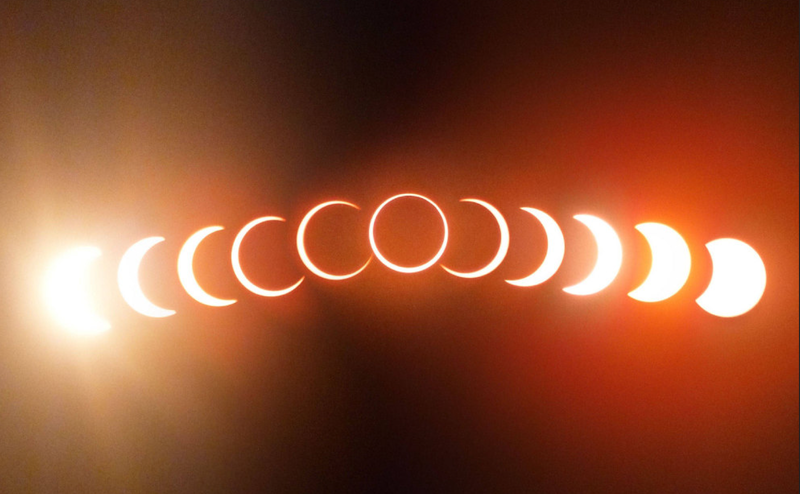 This type of eclipse is also known as an “annular” eclipse, because it involves the darkened new moon passing between the Sun and the Earth at such a precise distance – in this case, when the moon is close to its farthest distance from the Earth, making it too small to cover the sun completely – that it leaves a fiery ring of sun visible behind the Moon. In a “total” eclipse, when the Moon is closer to the Earth and so the Moon’s shadow is bigger, the shadow completely obscures the Sun. Who will get to see the whole eclipse? According to Space.com, the best place in the world to see it is a small area in Antarctica. But, partial phases of the eclipse will be visible in other places, including the southern Indian Ocean, Tasmania and the southeastern edge of Australia. Sydney, for example, is right in the track of the full eclipse, but the Sun will set below the horizon shortly before the whole thing can be seen. In Sydney, the eclipse will begin at 4:14 p.m.(“local time”) and the Sun will be 52 percent covered at 5:15 p.m. Sunset occurs two minutes later. Dang! In Hobart, the capital of Tasmania, the eclipse will begin at 3:51 p.m. (0551 GMT). Maximum eclipse will be at 5 p.m. (0700 GMT), and the sun will set at 5:17. Perth and other parts of western Australia will be able to see almost two-thirds of the eclipse, at its end. In Perth, it starts at 1:17 p.m. (0517 GMT), is at maximum (59 percent) at 2:42 p.m. (0642 GMT), and ends at 3:59 p.m. (0759 GMT). It’s a busy year for eclipses in general, with lunar eclipses earlier in April and again October 8. A partial solar eclipse occurs October 23. The next widely visible complete eclipse of the Sun will be March 20, 2015. « Why Did Tesla Skip The 2014 New York Auto Show? In Germany the time would be very early in the morning.